For Christmas this year, S got two very fun excavation kits. Despite them requiring many hours of work, she stuck with them and had a great time. I enjoyed them a lot, but they were a bit on the dusty side. I wanted to see if I could come up with an alternative that would be less dusty, that would also be easy to make at home. As an added bonus, our excavation is actually reusable! Score. Because an excavation like this requires a lot of patience and fine motor control, I'd only recommend it for ages 5 and up. You can make your excavation any size you'd like - the larger it is, the more time it will require. 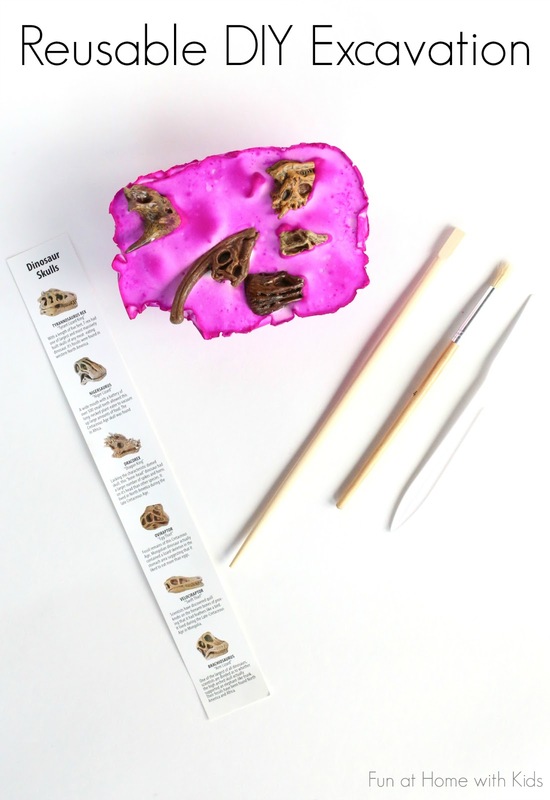 I let S use a plastic knife, a chopstick, and a paintbrush to free each dinosaur skull. If you'd like to make it a little easier, you can always have an adult crack the excavation into smaller pieces using a kitchen mallet. Though you can use any plastic toys in this excavation, I really liked this Dinosaur Skull TOOB because it comes with a key and S could match up the skull and learn a little about the dinosaur it came from. Take a small container and line it with foil. Use the foil to sculpt any shape you'd like, but make sure there are no holes. The foil mold you make should be well-supported by the sides of the container. Add 2 cups Plaster of Paris (you can find this at craft stores and/or home improvement stores) and 1 cup play sand to another plastic disposable cup/container and stir until well combined. Add 1 1/2 cups water (add liquid watercolors to the water to color the plaster if you wish - here I added about a Tablespoon of magenta liquid watercolors) and stir until completely combined. Add a few toys to your foil mold, then pour some of the plaster mix. Continue layering the toys and plaster until all the plaster is used up. Throw out the disposable container that you used to mix the plaster (do NOT pour plaster mix down your drain). Allow your foil mold full of toys and plaster mix to air dry for 24 hours. After 24 hours, carefully peel away the foil and allow it to dry for an additional 24 hours. After that it is dry enough to begin excavating! I strongly recommend having your child wear safety goggles just as a precaution. Getting a flying chunk of plaster in your eye is no fun. Also, please note that plaster dust is not good to breathe, which is one of the reasons I was a little disappointed in the dustiness of the storebought toys. Ours should not produce much dust, but if you do find it getting dusty, spray it down with a little water and that should take care of it. To reuse your excavation, save up all the pieces of plaster your child breaks off. Place them in a strong plastic bag (we use a Ziploc Freezer bag) and have an adult crush them into powder using a hammer (I recommend doing this outside to cut down on plaster dust). Use this powder just as you would in the above recipe - add 1 1/2 cups water (or slightly less if you lost some of the plaster in the process) and you'll have a second new excavation after 48 hours! Are you worried about breathing in the dust created by the Plaster of Paris? I added the sand to decrease the dust. We had WAY less dust than a standard storebought excavation. Asia, you are a genius over and over and over again! Thank you so much!!! <3 You are too sweet!